SOLD OUT The Dark Side is the U.K.'s magazine of the macabre, covering and reviewing horror films around the world. This is issue #177 - the Spine Tingler Special! One copy left and it is dinged and dented but still highly readable. 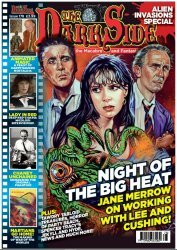 Plus, High Rising Horrors, On Set with Hammer and Amicus, Reviews, News and much more! Collectors Note: Brand-new and uncirculated. Remaining copies have dinged corners from shipping from UK.